With over 65,000 acres, Allegany State Park is the largest state park in New York State and is open year 'round with a multitude of outdoor activities for every season and every taste. The park offers 18 hiking trails, 3 of which have been developed as self-guided nature trails. Or bike along the 5.6 miles of paved trails which includes 3.1 miles around Red House Lake. You don't have to haul your mountain bike with you as they're available to rent so that you can enjoy the 20+ miles of mountain bike trails. If you want to spend time on the water, you'll find rowboats, paddleboats, paddleboards, canoes and kayaks available for rent. And of course, there are two sandy beaches where you can soak up the sun after a swim. Plan to fish?? Bait and other fishing supplies are available in the Retail Shop as well as ice, ice cream and cold beverages. One of the most spectacular places to see Autumn at its best is Allegany State Park(official). Drive, hike, bike or horseback ride through the park on its many roads or trails. You will be delighted you made the trip! You can enjoy most winter sports right here ... cross-country ski on the 25 miles of trails at the Art Roscoe Recreation Area. There are also special trails for snowshoes. Rentals are available at the Summit Mountain Shop. Snowmobile on the groomed trails that double as horseback riding trails in the summer. Stop by the Old Quaker Store and Museum to learn about the park and what people used to use while camping. The Park Restaurant has a new outdoor dining patio overlooking Red House Lake where you can enjoy burgers, wings, sandwiches, soup, salad, Friday Fish Fry or Sunday Breakfast Buffet. And don't forget your pup! The Park allows family pets as long as they're leashed, have written proof of their rabies vaccination and are with you at all times. Get the Allegany State Park Map online or request that we mail you one! Red House Tent & Trailer (April 1- mid December). Diehl Trail Campsites (April 1 to mid-December). Cain Hollow Campground in Quaker (Memorial weekend to Columbus Day weekend). 91; cross country ski 24; equestrian 45; bike/multi-use trails 5.7. 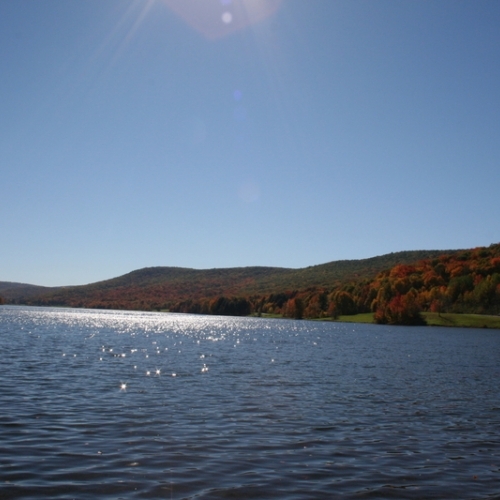 Amenities: Sand Beaches 2; Snack Bars (seasonal) 3; Restaurant (seasonal) 1; Gift Shops 3; Camp Stores (seasonal) 2; Museums 2; Showers and flush facilities (most areas); Trailer dumping station; Friends Boat Launch (Kinzua); Small boat ramps at Red House and Quaker Lakes. Please call 1-800-456-2267 for reservations. Want to be come more involved with Allegany State Park? The park is very lucky to have a large group of volunteers called Friends of Allegany State Park who help promote, preserve and maintain the park. Interested in becoming a Friend? Click here for more information.